As doctors continue to stress more exercise for individuals of all ages, there’s no better time than to use a day at the course as your primary source of exercise. Walking 18 holes has become a popular way for golf lovers to get more activity plus a great reason for getting out to the club more often. There are two popular ways to play golf as you walk. The first is by carrying your clubs from shot to shot. 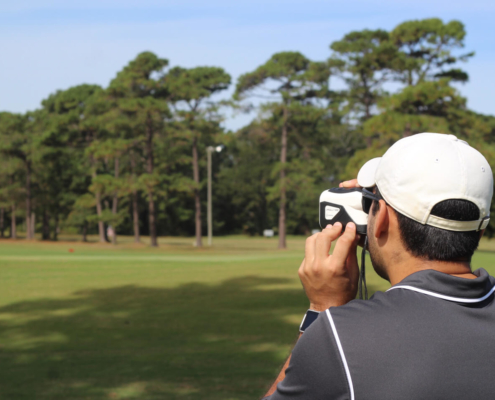 While this is the primary form of play for young amateur golfers participating in tournaments, it may not be feasible for older recreational golfers. And that brings us to the alternative, a golf push cart. Whether it be of the push or electric type, walking golf carts have exploded in popularity and as a result, increased in the quality of their features. So what do you need to look for in a walking golf cart? What features are essential? All of those answers are here in this definitive guide to golf carts. Push or Pull carts are manual carts that hold the golfer’s bag. The biggest difference between the two carts is the number of wheels. Push carts typically have three wheels, while pull carts have two. Push carts also differ from pull carts by being bigger with more storage and additional features like hand brakes that allow the golfer to use the push cart on rough terrain without worrying that the cart will roll away. Older golfers use push carts because they are easier on the body because the weight is moving forward rather than having to hold a cart behind their body and pulling for the entire round. Electric carts, or trolleys, utilize a battery to power the cart via a remote control or through a setting on the display of the cart that allows the cart to follow the golfer as they walk. Electric carts offer a wide variety of features that the golfer can enjoy from extra storage to changing the rolling speed to match the rate of your walking. Electric carts are easier to use than push or pull carts because all the work is done by the cart’s battery. These carts are great for golfers who suffer from long-term injuries who just want the exercise without pushing or pulling their clubs along the course. Walking 18 holes can burn close to a 1,000 calories according to Harvard’s Dr. William Kormos. If you hold the opinion that you want to exercise without feeling like you are exercising, then golf is a terrific platform for keeping your heart healthy while playing a game you love. Rather than carrying your clubs and causing stress to your back and legs, walking with a push cart is relatively easy on the body. Whether you are using an electric or manual cart, all you’ll have to do is focus on walking, making it a non-stressful approach to playing the great game of golf. Push golf carts are strong and offer all of the nooks and shelves required to hold a golfer’s personal items. Most push carts are equipped with designated areas for immediate access to your GPS devices and cellphone. When golfers use a push cart, they discover they are more conscious of the nature that surrounds them while they play golf. Many golfers welcome this newfound perspective and also enjoy how much better they feel when walking the course. Golfers must understand that folding a push golf cart demands some muscle and flexibility. Companies have taken significant measures to make the carts fold simpler, but they still can be tricky to break down, especially when you are first folding the push cart. Some golf pull carts offer an easy, one-step answer to folding and unfolding the cart for storage. That said, most of these carts are usually unsophisticated and possibly do not provide the qualities and conveniences that golfers expect from their push golf cart. When unfolding a push cart, the golfer has to be aware of the locking mechanisms that need to be freed before the cart can unfold. 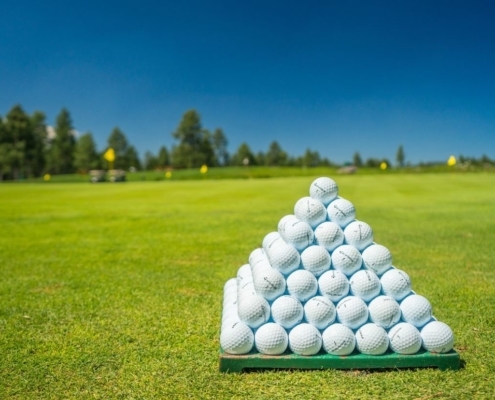 It is essential the golfer takes time to read and understand the instructions so that they can comprehend the physical demand that the cart will put upon them. However, as the golfer grows comfortable with the cart, they should find that the cart is uncomplicated to prepare for a day at the course. After you have collapsed your golf pull cart for travel, the golfer has to decide to how to transport the cart in their vehicle. Push carts typically break down tightly so they can easy be placed in the back seat of a four-door sedan. 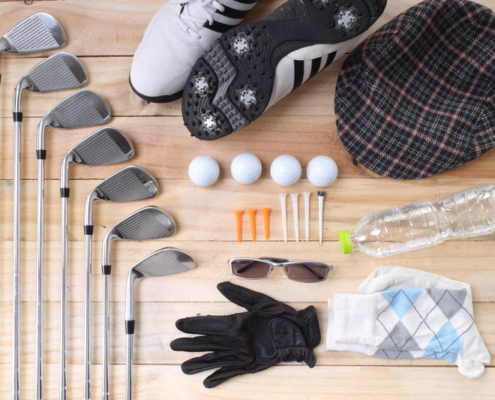 Finding the right area of the vehicle to avoid damage is also a crucial choice that must be determined by the golfer. For example, putting the cart in the bed of a truck makes the cart vulnerable to weather such as rain. As the golf cart ages, you can expect the cart will need maintenance from time to time. From changing the wheels to greasing the locking mechanisms to replacing the straps that hold the bag to the cart, it is vital to know how your golf cart works so you can handle issues when they arise. After owning the golf cart for a few years, you may notice the wheels have become unevenly worn, or if you have inflatable wheels, you see a noticeable decrease in air pressure. Wheels on a cart are crucial for keeping the cart level and supporting a smooth roll. Changing the wheels is an easy process that includes removing the affected tire and replacing it with a new one. If the tire is inflatable, you may be able to patch the tire from the inside so that it can hold air again. Another problem to look for is if your bag is too big or the pedestal is loose, then it is possible that the bag rubs against the front tire and causes friction that wears down the wheel and damages the bag. A slight adjustment of your bag or by replacing the pedestal can make that issue go away. Brakes also wear down over time on a manual push cart. You may have to replace the brake line from the wheel to the handle to restore the stopping power of the cart’s brakes. Another area that can malfunction is the handle and possibly needs replacing if you notice it failing to stop the cart. Golfers may find a problem with the locking mechanisms that allow a cart to fold. Normally, if there is an issue, it involves the locks sticking and not permitting the frame to unfold. A test of the lock with a tool, like a screwdriver, can fix the issue by popping out the lock. If the lock is rusted and hard to move, then some WD-40-type oil will help slide the slow lock. Golf bags are secured on a push cart by using straps to fasten the bag against the frame of the cart. 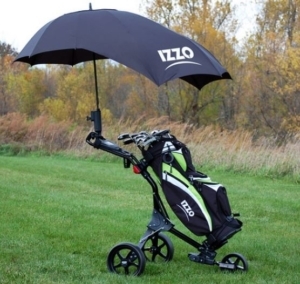 The golf bag also is reinforced by a stand located toward the end of the cart that assists in locking in the bag. By stationing the bag on the pedestal, the golfer can balance the bag on the cart to allow smooth rolling of the push cart as you play your round. For the golfer, it is wise to ease the sole of the bag down onto the pedestal first then prop the bag against the frame of the cart. Usually, some guides hold the upper section of the bag so the golfer can secure the bag using straps. Two types of bags are commonly used with electric or push golf carts. 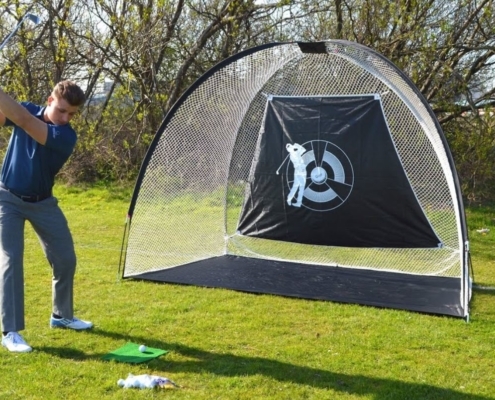 The stand bag uses two collapsible legs that push out when the bottom of the bag makes contact with the ground. Stand bags are light, easy to hold and are made for simple carrying over the golf course. The second bag is a cart-style bag that is heavy and created with several pockets for storage. Although you’ll see pros on the PGA Tour use cart bags, their caddies carry the burden by toting the bag around the course. Cart bags have a heavy-duty sole on the bottom of the bag making them easy to place on a push cart. How do Electric Golf Push Carts Work? Electric golf carts are sophisticated machines that use either a remote control or a control panel to set speed and determine direction when the cart is moving. 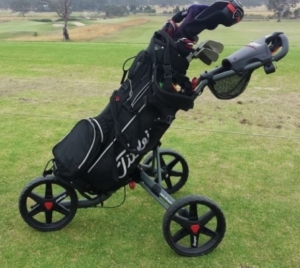 Powered with either an Lithium Ion or Acid battery, electric golf trolleys draw power from the battery to move the wheels in the direction and pace that the golfer feels best serves his round. 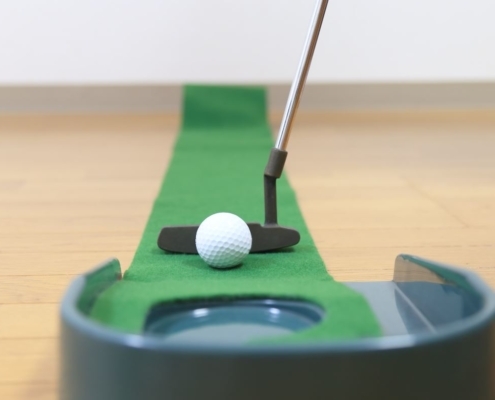 For carts with remote controls, golfers can easily send the cart ahead to the golf ball so that the clubs are waiting, ready for the next shot. Other electric carts that use control panels must have their path set by the golfer before they can roll toward the golf ball. It is vitally important for the golfer to understand and test out their electric trolley before they hit the course so that they don’t have any problems that could delay their round. Batteries are the power source of the electric golf caddy. They provide electricity to the motors that move the wheels and guide the caddy in either forward or reverse as the golfer needs. Batteries can differ in weight and add a large load to the cart because of the requirement to supply additional power to the caddy to carry the extra weight. Lithium Ion batteries weigh less and are more environmentally conscious than other batteries like the acid battery. These Lithium-Ion batteries add around 12 pounds to the total weight of the electric caddy. Lithium-Ion batteries are expensive but maintain their full-charge capacity for over 500 charges, a storage capacity that should last a golfer for many years. Sealed Lead Acid batteries are the heavy-duty behemoths that most of us commonly imagine when we think of car batteries. These batters are large and extremely heavy as most SLA batteries clock in at close to 25 pounds. They are less expensive than their Lithium-Ion competition but take a very long time to charge. The positive thing about Sealed Lead Acid batteries are that they are relatively cheap. If the SLA battery goes bad, then you can expect to pay only a fraction of the cost of the Lithium Ion battery. One of the essential features of an electric caddy is a battery charge meter that is located on the display screen. This meter gives golfers an approximate percentage remaining on the life of the battery. 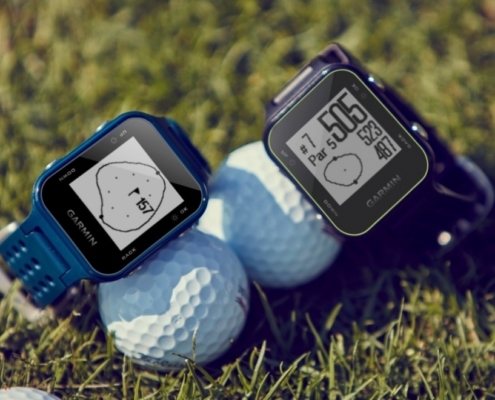 This feature is very helpful when the golfer is doubtful if the battery can last after a quick nine holes. Golf carts, whether they be a three-wheel push, two-wheel pull or electric, serve a necessary purpose for golfers who are looking to get some exercise without the strain of carrying their clubs all over the course. Push or pull cart offers a manual alternative to walking the course while keeping your bag freely accessible. Most push carts have three wheels and can easily handle any terrain that you may need to navigate during your round. Pull carts are less sophisticated and must be towed behind your body, but they are easy to fold and store in your vehicle when traveling to the course. The most expensive option, but overwhelmingly the most popular among golfers is the electric cart. The electric cart comes in either a remote control or control panel version and is adjustable to provide a smooth ride for your clubs. With a host of features that offer storage and simplicity, golf carts are affordable ways to keep your feet moving, your heart pumping and your clubs secure and safe from damage.